The Commonwealth Museum is most appreciated by students who are studying (or who have already studied) early Massachusetts history or government. 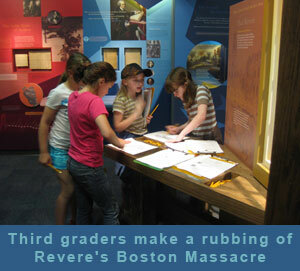 However, a visit to the museum can be an ideal introduction for children who are going to study the history. School groups visit us during the school year (we are booked almost every day,) primarily they are third through eighth graders. When the school groups come in they use grade level educational packets that are aligned to the state frameworks. 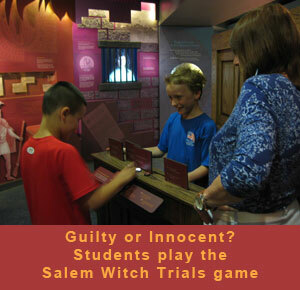 Salem Witch Trial Game – students question one another to see if they might have been accused of being a witch in the 1600’s. 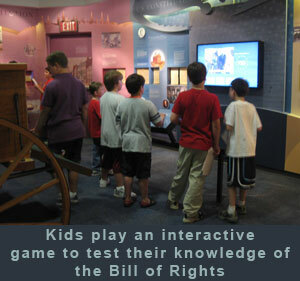 Know Your Rights Interactive Video– individual rights are brought to life and made relevant by students telling their stories, visitors decide whether the individual’s rights were violated and why. Travel Game – students compare different methods of travel from 200 years ago. Spindle Game – students power and operate a simulated factory machine from a textile mill, which brings to life the hardships put on mill workers which fueled the need for workers’ rights and education reform. Children are always interested in our treasures gallery where they have the opportunity to see the copper plate engraved by Paul Revere and our state’s founding documents up close and personal. They love to speculate what might have caused the stain in the upper right hand corner of the 1691 Charter of the Province of Massachusetts and to see John Hancock’s larger than life signature on the Declaration of Independence. A visit to the museum is concluded with an uplifting 10 minute movie in our state of the art surround sound theater that ties up the themes of democracy and individual rights. We are always free to the public . Our hours are Monday- Friday from 9-5, excluding major holidays. From the north: Rte 3/I-93S to exit 15 (Morrissey Blvd/JFK Library). Follow signs for UMass and JFK Library. From the west: Rte I-90/Mass Pike to I-93 South. Follow signs for UMass and JFK Library. From the south: Rte 3/I-93N to exit 14 (Morrissey Blvd/JFK Library). Follow signs for UMass and JFK Library. Take the MBTA Red Line to JFK/UMass station. Free shuttle Bus #2 stops at the Archives Building and the JFK Library. The bus runs every 20 minutes from 8 a.m. to 5:30 p.m. on the hour and 20 minutes after and before the hour.